Spiegel and fellow co-founder Bobby Murphy control the lion's share of Snap's voting rights, making them effectively immune to any activist campaign that calls for a sale effort. Snap Inc. (SNAP - Get Report) co-founder and CEO Evan Spiegel has rejected buyout offers for his company in the past, and appears intent on keeping it independent in the years to come. If Snap's stock, which is now down over 60% from its $17 March 2017 IPO price and nearly 75% from an opening trade of $24, continues to languish, Spiegel's stance is likely to put him at odds with many of Snap's shareholders. However, thanks to Snap's share structure, the company's public investors have little direct power to make Spiegel change his mind. Snap's challenges have been well-documented over the last couple of years by yours truly and many others. While the company still has a core base of younger U.S. and European users who actively use its ephemeral messaging services and/or Snapchat Stories, its daily active user (DAU) count has stagnated amid stiff competition from Facebook's (FB - Get Report) rival services (particularly Instagram Stories) and an app redesign gone wrong. 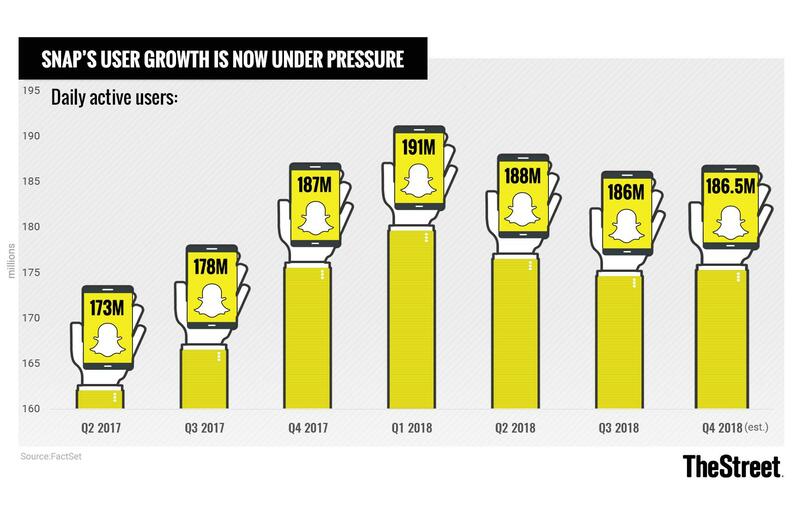 Revenue growth has also failed to live up to pre-IPO hopes, as Snap battles Facebook and Alphabet/Google (GOOGL - Get Report) for digital ad dollars while having much less scale and user data than either. And though Spiegel declared in a late-September memo that Snap aims to be profitable for the whole of 2019, the company's cash burn remains heavy for now. Nonetheless, when asked about Snap's future earlier this month at this year's DealBook conference, Spiegel asserted his company will be independent five years from now. "We have a real belief in what were trying to accomplish, and we believe that it's fundamentally different from what we're seeing in the world," he added. "We really just want to make sure that we can continue to make that vision real." Spiegel, to be fair, does have (as outlined in his memo) a unique vision for Snapchat as a social platform -- one involving a camera-centric interface, rapid and constant photo/video sharing, the separation of social interactions from public content consumption and strong support for augmented reality content that can be added to photos and videos. And it's understandable that in a social media landscape featuring only a limited amount of competition, Spiegel would want a chance to fully realize his product vision without having to worry about a corporate parent altering or rejecting parts of it. But Spiegel's ambitions are colliding hard against competitive and financial realities. Though Snap's revenue is still expected on average by analysts to grow 31% next year to $1.53 billion -- given Snap's pressures, as well as how much estimates have been cut since the IPO, it's hardly a given that this target will be achieved -- it's nonetheless expected to see free cash flow (FCF) of negative $590 million in 2019, after posting FCF of negative $784 million in 2018. In addition, Snap, which ended Q3 with slightly over $1.4 billion in cash, is expected to burn another $740 million between 2020 and 2021. The company's headcount of roughly 3,000 employees -- it's not far removed from Twitter's (TWTR - Get Report) headcount, even though Snap's expected 2018 revenue is expected to be more than 60% lower -- continues to weigh on its bottom line. So does the fact that (unlike Facebook and Google) Snap relies on third parties for its cloud infrastructure needs rather than its own data centers. Moreover, as Jim Cramer recently noted, Snap signed contracts with Google and Amazon.com (AMZN - Get Report) in early 2017 (a point in time when user growth was much stronger) that require it to buy a combined $3 billion worth of cloud services from the companies over the following five years. Barring major improvements in the company's top-line trajectory -- improvements that are likely to prove tough without a healthy pickup in user growth -- there's a good chance that Snap will have to raise cash by 2020, if not sooner. And if the company's stock is still floundering at the point when it's compelled to raise new funds, raising that money won't be easy -- especially not without badly diluting existing shareholders. If Snap had a normal capital structure, its situation would arguably be ripe for an activist investor or two to jump in. One could imagine activists calling for major cost cuts, while also urging Snap's management to explore "strategic options." With Snap's market cap now below $9 billion, a company like Google -- which reportedly offered $30 billion for Snap in early 2016 and has the infrastructure, advertising and distribution resources to improve both its top and bottom lines -- could conceivably bid for Snap if it was put on sale. However, Snap's three-class share structure makes it all but impossible for an activist campaign to succeed, should Spiegel and co-founder/CTO Bobby Murphy oppose its goals. Between them, Spiegel and Murphy control over 80% of Snap's voting rights, giving them free reign to run the company as they see fit. Spiegel perhaps signaled just how little he cared about answering to public investors in August, when Snap hosted a shareholder meeting that lasted just three minutes. It's certainly possible that Spiegel has a change of heart regarding his willingness to put Snap on the block, particularly if its cash-flow profile doesn't show major improvement over the next couple of quarters. Spiegel and Murphy can't be pleased about the impact of Snap's plunge on their net worth, nor can they be blind to its impact on Snap's ability to retain employees who have been granted stock packages. In October, Cheddar reported that an employee survey indicated 40% of Snap employees plan to leave the company, up from the 29% indicated by a survey in Q1. But for now, one has to take Spiegel at his word when he talks about wanting to keep Snap independent. Certainly, judging by how Snap's stock has been performing, Wall Street is currently wagering that the odds of Spiegel agreeing to a sale, rather than pushing ahead with a challenging turnaround effort, aren't that high.